So, you want to take New York by storm? You want to step out onto those streets and own them? Well, the way you travel says a lot about you in NYC. So, these are some of the best ways you can travel around the city and make the most of your time out and about. Walk – We all need to walk to travel wherever we go. And, in New York, there are so many places you can walk. You can walk the length of the city for exercise, sightseeing, or to get to where you want to be. It might even be an idea to walk through Central Park and take in a different sort of view of the city. Walking is healthy and good for keeping you in shape, as well as saving the pennies too! Ride – Aside from walking or running, you might want to take a chopper. No, not a helicopter; a motorcycle! Yeah, there is plenty of scope for riding your motorbike around the city. If you’ve never considered this before then here is the amateur’s guide to motorcycles so you can choose the best sort. This is a much cheaper, more practical, and, frankly, cooler alternative to driving. Skate – If you want to take a more novel approach to travel around the city, you might consider skating. There is a large skating culture in the US so you should feel right at home. Whether you’re gliding across Central Park, or negotiating Manhattan pavements, skating is fun. And these days you can even get electric skateboards! Check out boostedboards.com to find a review of electric skateboards. They will add some stylish convenience to your skating adventures. Subway – Ah, the New York City subway. One of the great man-made inventions in our world. It’s quick and efficient, and a cost effective way of getting around. You can travel the length and breadth of the city on the subway. Just make sure you don’t get on the wrong line and end up in Queens when you live in Manhattan. Get to know the subway and use it on a day to day basis. It will make your life so much simpler as a result. Bus – The subway isn’t the only method of public transport in the city. You could also use public buses as well. These are a cheaper and easier way of getting around the city. Sure, the subway is faster and probably more appealing. But buses can take routes that the subway doesn’t, and they tend to cost less. Familiarize yourself with the bus route you have to take so you know it like the back of your hand. Taxi – Another common form of navigating New York is to use a taxi. This is something every New Yorker has done at some point in their life. And it’s actually a really efficient way of getting around. Many cabbies know shortcuts and alternative routes to get you to your destination. You could build a rapport with a cabbie and use them as your regular driver every time. Taxis save you having to drive yourself, and they’re perfect if you want to have a drink. But, you have to make sure you have plenty of money as the cost can build up. Drive – Who doesn’t love to cruise around the city like they own it? Windows down, system up, hanging out the window to catch the eye of the beautiful girl that passes by! 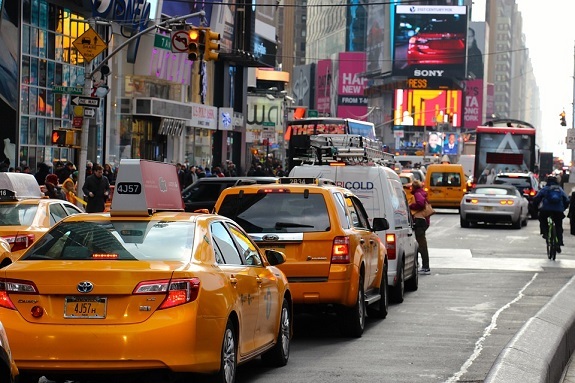 Driving is one of the most common ways of negotiating The Big Apple. But, because of this, you have to deal with a lot of traffic. And the city can get gridlocked and come to a standstill frequently. So, driving may not always be the best option, but it certainly makes you cool and stylish. Fly! – Okay, maybe you can’t fly around the city to get a Starbucks or collect your dry cleaning. But, you can’t certainly arrive in New York in a flying fashion. Newark or JFK should be the airports of choice. You’re going to feel every inch the successful guy as you land on the runway in The Empire State. You’re finally here, you’ve arrived. Welcome to the bright lights. New York looks so amazing from the air, and flying there allows you to experience things a little differently from what you’re used to. New York isn’t going to see you coming! You’re not just a regular man on the street. You’re not the Everyman you pass every day. You are unique, original, a trendsetter, a rule-breaker. This is your town, and you’re going to travel however you see fit. You’re certain to turn a few heads with this mixture of travel methods.